This race became a BIG undertaking for me, with making the decision to go race and have an epic vacation with my now, fiancée Rachel, it was going to take a lot of preparation to do this. 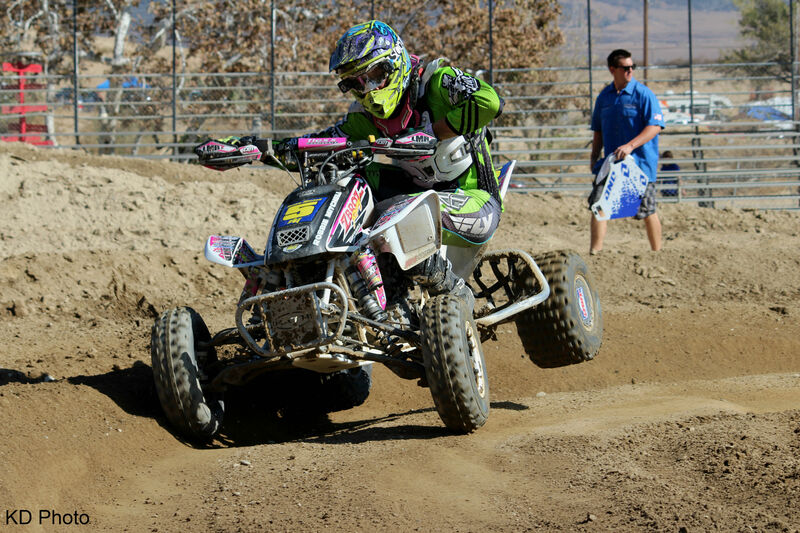 I started by contacting the owner of The Quad Squad Australia, Adam Siemensma to see if I could use his quad for Finke. He obliged and the work began. I started to fund raise by giveaways from my awesome sponsors, gofundme page, selling advertising space on my t-shirts, selling the t-shirts, and by helping my parents sell their condo to make the rest of the cash. I sent my suspension, wheels/tires, gear and a camping setup for Rachel and I to Australia. Thanks to Fasst Company for helping me get it shipped away. I employed my now friend, Cade Cowdin (owner of Official Strength in St. George), to help me get the physical and mental strength to 100%. It was literally a transformation for me; I have never been that mobile, fast, powerful and strong in my life. I knew in my mind that no one was working harder in the gym than me and I know it would translate when it got tough out there. Sam at Dirt Fiend Racing brought back the popular “Tank” graphics kit to represent America. I was ready to get down to the Outback mate! I have to thank everyone that helped me get to this race and fulfill a dream. You don’t know how much it meant to me to try to win and represent for the USA! 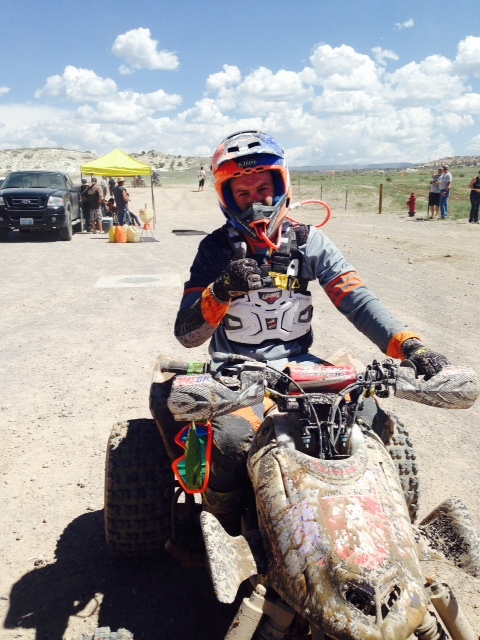 Back in October Colt Brinkerhoff headed East for the GNCC Ironman. We caught up with him about his adventure and got the scoop on what happened while he was there. Colt injured his wrist and wasn’t able to finish the race, but posted that he was certainly keeping redemption in mind for the ’14 season. Colt raced one a YFZR prepped by Walker Fowler and his crew, took his own posse of folks to Indiana, and the outcome you will be able to see on video because Gerald is a soon-to-be YouTube sensation. “I am grabbing WORCS by bars and pining it. If you bring a new rider to WORCS or an old WORCS racer back I will make their entry half price and your entry half price. I am going crazy up in here. See the coupon below and no you don’t have to bring it with you. I also want to thank all of our current sponsors that make it happen and welcome a new one to the family. Humboldt Racing (http://www.humboldtmotorsports.com/) is a fabrication shop that builds top of the line race rigs. They will be on hand will [sic] full fabrication support for all teams.” – Tim Shelman Director of Operations. Robbie Mitchell has been a WORCS pro for quite some time. This year aboard his Honda he had a stellar start to the season, even under tough track conditions, but fell just shy of the podium later on. Robbie tells us about his season, what he learned, and gives a little bit of advice to the up-and-comers. You had a great start to the season, but struggled in the middle, and then finished out strong. What happened? The first of the season was great! Then I had a race that I wasn’t mentally ready for. After that I just had small mechanical issues. At Taft my air box mount broke, Pala I ran strong but my wheel came loose at the end forcing me to limp the last 3 laps. Then I broke a chain at Glen Helen and bent a couple of sprockets at Honey Lake. It was really frustrating! But I learned a lot and everything will be better next year! Cd’s are $30, they take 4-5 weeks to be delivered, and you get 20-30 high resolution pics with copyrights. WORCS has released their 2014 schedule which has Straddleline back on the map. We hear that it will be a double points round to encourage riders to make the journey. Considering most of the races are too far for any but SoCal or Nevada riders to participate in the whole season, it’s disappointing they don’t spread out the geography a little more to draw a wider base. Missing from this year is an Arizona track, but it’s neat to see that Sand Hollow is returning. Hopefully that TBA is a new location WORCS hasn’t been to, or hasn’t been to in a long time. We’re happy to see Straddleline back on the map and looking forward to next year’s races. What do you think of the schedule for 2014? Note: Joe will start Friday’s school between 8-9 Friday, depending on how tired you are. I wanted to take just a moment to clear up the possible confusion regarding the Joe Byrd School.Please know that when dates were being tossed around, we were looking for the optimum time to provide this opportunity… the biggest request was to wait until most of the racing seasons were over. Thus, the final date we selected. 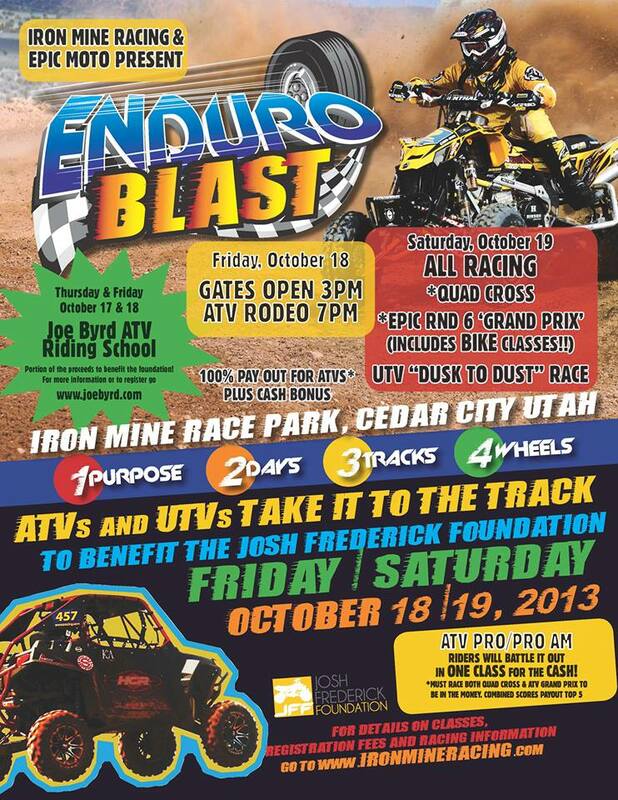 Benefit race for Josh Frederick immediately after a Joe Byrd ride school at Utah’s Iron Mine Race Park! “For those who attend Joe’s school, we will comp your dry camping, your gate fees, AND one race entry!” – Darci Hansen, Iron Mine promoter. Joe Byrd’s famous schools will teach you plenty to apply at the race. 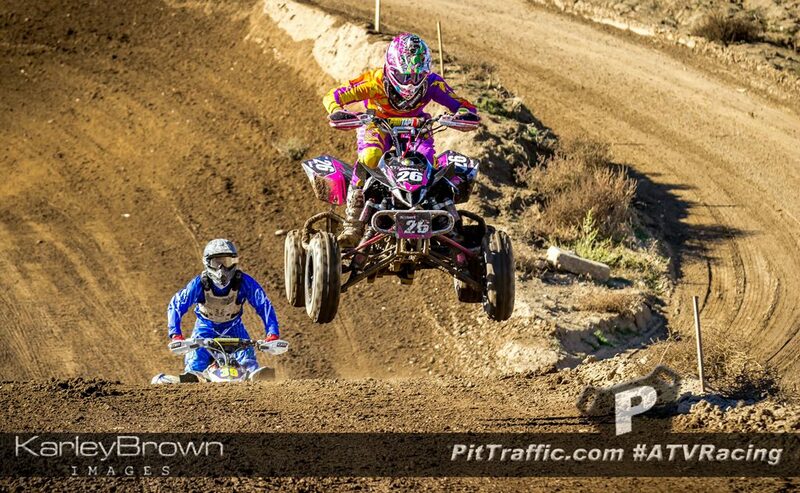 Classes for ATVs & UTVs including Quad MX, GP (with bike classes), and a Dusk to Dust race for the Side by Side guys. The proceeds from the race benefit the Josh Frederick Foundation.